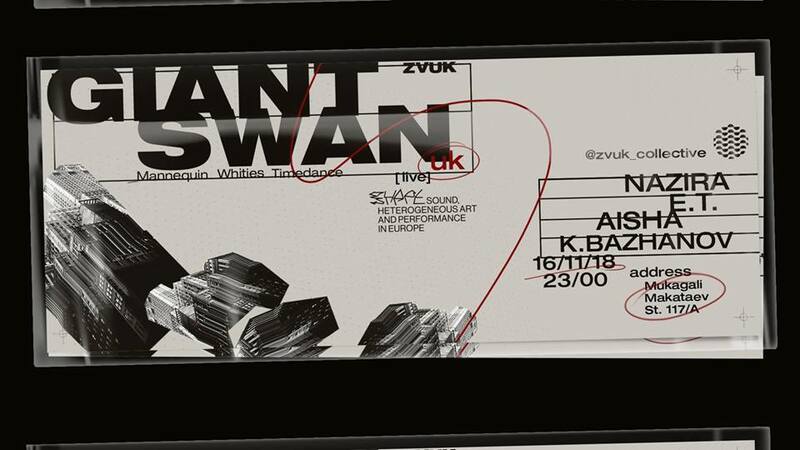 British duo Giant Swan play at Almaty’s staple ZVUK, presented by Unsound Festival. Currently docking in Bristol, UK, Giant Swan is the brainchild of Robin Stewart & Harry Wright; an acerbic marriage of energised, aggressive dance music, quaking bass and hypnotic electronic noise. Across a table of machines and pedals, incorporating abused guitar and liberal vocal manipulation, Giant Swan create a cross-breed of hypnotic bass, industrial percussion and disorientating energy delivered with telepathic intricacy. Vital players within Bristol’s Howling Owl collective and with strong ties to the city’s deep musical heritage, Giant Swan have steadily spread their wings across the UK and Europe, sharing stages with the likes of Surgeon, Vessel, Shackleton, Venetian Snares and Container.